This model has been built with the differential expressions in Dupont's 1991 paper. This file is known to run in PCEnv and COR, and parameters for constants (beta) can be altered to produce all diagrams of figure 2 in the paper. The current parameterization is set to reproduce beta = 60% (0.6). The initial conditions Z = 0.52 and Y = 0.93 were found by allowing the model to run till steady state at 100 seconds. We consider a simple, minimal model for signal-induced Ca2+ oscillations based on Ca(2+)-induced Ca2+ release. 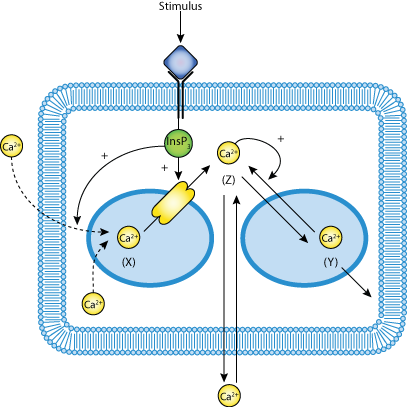 The model takes into account the existence of two pools of intracellular Ca2+, namely, one sensitive to inositol 1,4,5 trisphosphate (InsP3) whose synthesis is elicited by the stimulus, and one insensitive to InsP3. The discharge of the latter pool into the cytosol is activated by cytosolic Ca2+. Oscillations in cytosolic Ca2+ arise in this model either spontaneously or in an appropriate range of external stimulation; these oscillations do not require the concomitant, periodic variation of InsP3. The following properties of the model are reviewed and compared with experimental observations: (a) Control of the frequency of Ca2+ oscillations by the external stimulus or extracellular Ca2+; (b) correlation of latency with period of Ca2+ oscillations obtained at different levels of stimulation; (c) effect of a transient increase in InsP3; (d) phase shift and transient suppression of Ca2+ oscillations by Ca2+ pulses, and (e) propagation of Ca2+ waves. It is shown that on all these counts the model provides a simple, unified explanation for a number of experimental observations in a variety of cell types. The model based on Ca(2+)-induced Ca2+ release can be extended to incorporate variations in the level of InsP3 as well as desensitization of the InsP3 receptor; besides accounting for the phenomena described by the minimal model, the extended model might also account for the occurrence of complex Ca2+ oscillations. Schematic diagram of the cell model for signal-induced, intracellular calcium oscillations. Derived from workspace Dupont Berridge Goldbeter 1991 at changeset 2ea68da8b864.